FREE GIFT with $32.50 Estee Lauder Skincare or Foundation purchase! 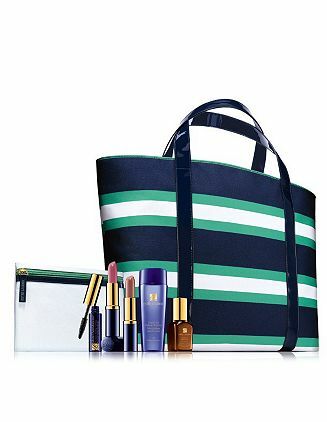 ESTÉE LAUDER SUMMER GETAWAY GIFT! Free with any Estée Lauder Skincare or Foundation purchase of $32.50 or more. Just the ticket for a great summer escape: a chic striped beach tote, an advanced repair serum in a deluxe gift size, the season’s best color and more. Tote Bag with matching Makeup Case One offer per customer. While supplies last.